Concrete walls built with insulating concrete forms effectively buffer a building’s interior from the outdoors. The thick ICF sandwich of a massive material (concrete) with a light one (foam) sharply cuts fluctuations in temperature, air infiltration, and noise. They keep buildings' interiors more comfortable and quiet than ordinary wood frame walls. How do ICF Walls Increase Comfort? The continuous layer of foam insulation along the ICF wall helps keep the temperature the same everywhere. It virtually eliminates the “cold spots” that can occur in frame walls along the studs or at gaps in the insulation. 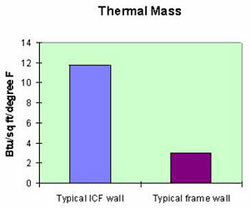 The heavy concrete of the ICF wall gives it the heat-absorbing property of “thermal mass”. This smoothes out swings in temperature over time. Therefore, the building does not tend to overheat or get suddenly chilly as the furnace or air conditioner cycles on and off. The interlocking foam faces, sealed with continuous concrete in the center, make ICF walls exceptionally airtight. This means that drafts are cut sharply. 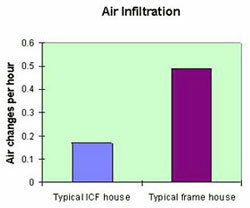 In tests, structures built of ICFs had only about 1/3 to 1/2 as much air infiltration as the typical frame building. What about noise? Massive materials like concrete tend to reflect noise. 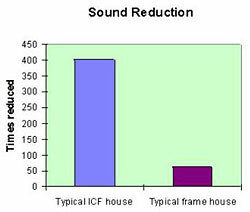 Compared to a typical wood frame wall, only about 1/4 to 1/3 as much sound penetrates through an ICF wall. Scientists would describe loud speech on the opposite side of a frame wall as "audible, but not intelligible." On the opposite side of an ICF wall, a listener would "strain to hear" loud speech. It would be virtually inaudible. Massive materials like concrete tend to reflect noise. 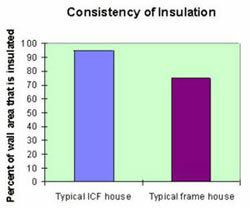 Compared to a typical wood frame wall, only about 1/4 to 1/8 as much sound penetrates through an ICF wall. Scientists would describe loud speech on the opposite side of a frame wall as "audible, but not intelligible." On the opposite side of an ICF wall, a listener would "strain to hear" loud speech. It would be virtually inaudible. But is the difference really noticeable? 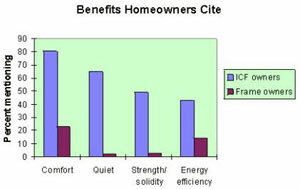 Over 60 percent of ICF homeowners mentioned the quietness of their homes, versus only 2 percent of the wood frame homeowners. "I looked out the window and saw the traffic on the road, but I couldn’t hear it." "While talking with my neighbor one morning, he asked if the thunderstorm the night before woke me up, too. But until that moment I never even realized we’d had one." When planning a building, consider the greater well-being that could come from living with a more even temperature, sharply reduced drafts, and noticeably greater quiet. These things are available with concrete walls built with ICFs. They effectively shelter the interior environment from the harshness of the outdoors. ICFs provide a building with quiet and comfort all year round.